It is solar powered so the working time depends on the weathe condition, the season and the location etc. it is only water-resistant. so please do not immerge it into water. • Two Way Lighting Solution: 0 Way Lighting Solution Powered by solar panel (included) and battery(not included). The World First Dual Power Technology is to bring you more simple and convenient solution and lighting up your world with colorful and romantic. • Every piece of Walmart product passes rigorous inspection at our Quality Assurance labs. So you can buy with confidence guaranteed. • 8 Modes setting: 8 Modes setting for Christmas Decorations combination, in waves, sequential, slogs , chasing/flash, slow fade, twinkle/flash, and steady on. 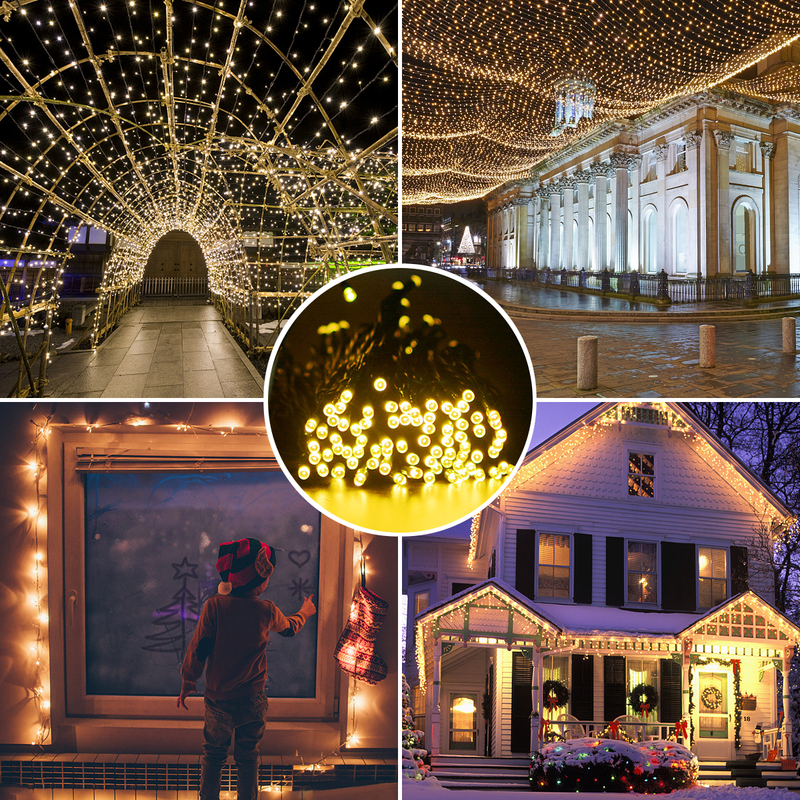 • IP 65 Waterproof: IP 65 Waterproof for indoor and outdoor Christmas decorations- Can withstand all kinds of weather. The duration time of the lights working will not be influenced by different weather, seasonal, geographic and other factors. • Long Working Time: Long Working Time LED Solar Christmas Lights illuminates up to 8 hours at night if the panel absorbs enough sunshine during the day. The external battery can use for about 5-10 days which depends on the modes and the battery you choose. • Dual Powered, More Practical: Dual solar and battery powered Christmas decoration lights will working will not be influenced by different weather, seasonal, geographic and other factors. • Special Decoration Effects: Live, Love, Create, add a warm and charming atmosphere for your home, patio, lawn, garden, shops, bars, caf, restaurant, balcony, walkways, pergola canopy, and more.